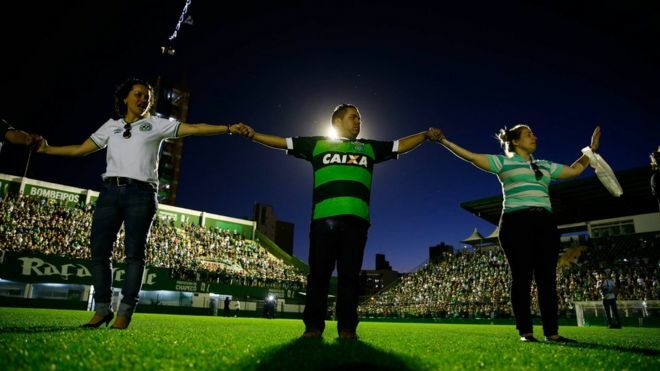 CHAPECO, Brazil (Reuters) – The Brazilian town of Chapeco, its buildings draped in the green colors of its devastated soccer club, prepared on Saturday to receive the bodies of victims of an air disaster in Colombia that killed 71 people and wiped out the team. The crash on Monday night shocked soccer fans the world over and plunged Brazil, South America’s biggest nation, into mourning. The BAe146 regional airliner operated by Bolivian charter company LAMIA had radioed that it was running out of fuel before smashing into a hillside outside the Colombian city of Medellin. Only six people survived, including just three members of the soccer side Chapecoense en route to the Copa Sudamericana final, the biggest game in its history. 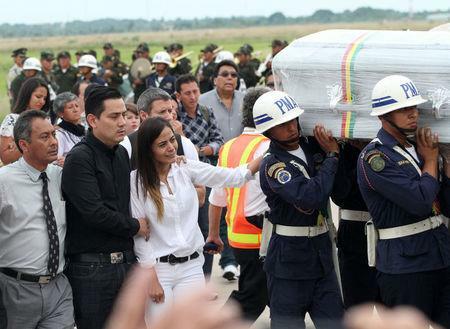 Bolivian President Evo Morales pledged to take “drastic measures” to determine what caused the crash. Bolivia has suspended LAMIA’s operating license and replaced the national aviation authority’s management. In Chapeco, a small agricultural town in southern Brazil, dozens of fans kept vigil at Chapecoense’s stadium, where an impromptu shrine swelled with fresh flowers and handmade posters. Green and black cloth was draped from fences, store fronts and construction sites. Fans of the Chapecoense team walked from the town centre to the stadium where they prayed and sang. A service was also held in the city’s cathedral. The team was flying to Colombia for the biggest match in their history when their plane went down shortly before landing in Medellin, late on Monday. Some 10,000 people – including family members of the players – gathered in Chapeco’s Arena Conda stadium on Tuesday evening, still stunned by the news from earlier in the day. “And we came here today, we sat here, but we know that this weekend, next week, our fighting team won’t be here anymore in this stadium…. Ronda Rousey, the biggest name in women’s MMA and one of the biggest in the whole sport, remains the undefeated UFC women’s bantamweight champion, after knocking out contender Bethe Correia during a bout on Saturday. A fight that lasted a whopping 34 seconds.